Steak is a grilled piece of fresh, almost steamy beef that is taken from the intercostal part and cut across the grain. Well done is well-done steak. True gourmets prefer to eat the first three types of product. They think that well done steak tough and not juicy. How to broil steak in the pan? As the inhabitants of cities do not always have the opportunity to purchase fresh meat, that's available to use frozen. His "lead in the required form" on the day in the General division of the fridge or a couple hours in a vacuum pack in a pot of cold water. But to use a microwave or in a container with warm water not recommended. Otherwise the upper layers of the meat warms up, and the core of the piece remains cold. Consequently, to ensure uniform roasting of the product. Steak never discourage. Otherwise, the structure of meat fibers will be broken, and the piece will lose juiciness, tenderness natural. There is no one recipe for how to cook a steak. Each process of salting meat is to be interpreted in its own way. 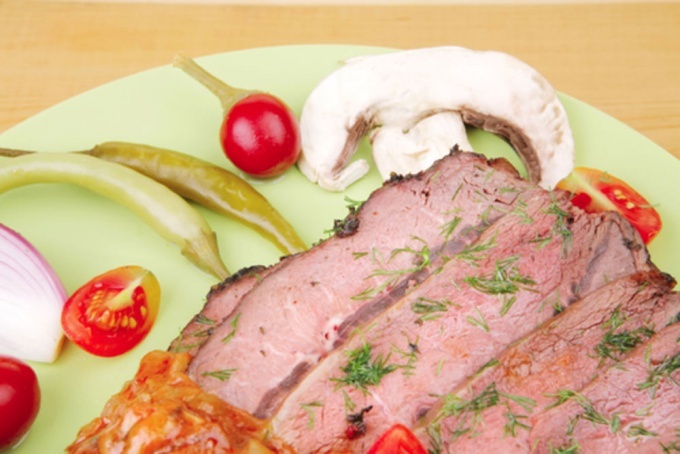 Some cooks suggest salting the meat in advance, at a time when it is marinated. Other experts claim that adding the appropriate salt after frying. Then the meat does not become dry. Classic recipes allow obvalivanie meat pieces in salt, pepper and a mixture of French herbs - Basil, thyme, rosemary, paprika, parsley immediately before frying, if it is not on the coals, and the frying pan. Prepared steak grease on both sides of any vegetable oil. Because of this, the meat will not burn and the heat inside it will be distributed more evenly. The pan is well heated on the fire, smeared with butter. And only after that you put it on the steak. The average duration of roasting where meat is juicy, about 10 minutes. During this time, the piece has to be flipped several times. After the meat was prepared, he gets to lie down for a few moments. Due to this, the juices that are in the process of cooking was accumulated at the outer layer, down and evenly distributed throughout the thickness of the piece. How to cook a steak on charcoal? Cooking steak on coals has its own peculiarity. A piece of meat quickly fried first with one then with the other hand. The result is a durable crust, which will not allow meat juices to flow out. After that, you can not rush in the time of the next flip steak, and cook as usual. Steak served with wines made from grapes Pinotage, Syrah and Merlot, Shiraz. They go perfectly with the meat, enhancing its flavor. Fit here and a little sour wine Cabernet Sauvignon. Birthplace of steakand portion meats) - prudish England. Translated from the English "beef steak" means "beef". The recipe this steak is not complicated, but requires adherence to a few very important rules that are juicy and fragrant dishes. First, the main key to getting the juicy classic steak is the choice meat. The best steak get fresh chilled meat that are not exposed to freezing. The meat is pre-supposed to get from the fridge to frying it reached room temperature. From the most tender part of beef is called steak "tenderoni" (or filet Mignon). It features a small size, rounded shape and very delicate flavor. The tenderloin on the steak free from films and cut across the grain pieces not thinner than 3 cm. For steak more impressive size take part of the sirloin of beef at the butchers call a thick edge. For steaks from the thick edge of the meat cut across the grain into pieces with a thickness of 2 -3 cm. Steak sirloin, lightly beat the two sides of a wooden meat hammer. So, the meat for the steaks you have cut. Put it on a paper or cotton towel to remove excess moisture from the surface. Now sprinkle the pieces on both sides of the salt with spices. 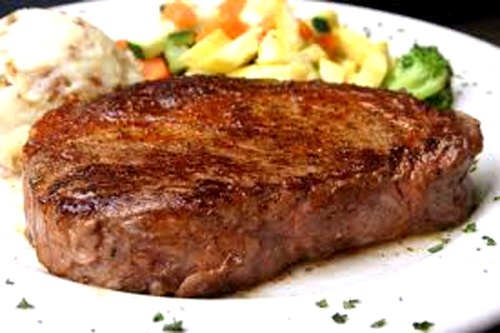 Lightly RUB each steak with two sides in vegetable oil. In a frying pan with a thick bottom pour vegetable oil and calcined. The emergence over the frying pan light white haze means that the desired temperature for cooking steak reached. Do not place several steaks in the pan, this will lower the temperature and meat can give a juice, which greatly impairs the taste of the dish. Fry each steak on both sides in a constant temperature of fire to the desired degree of cooking. 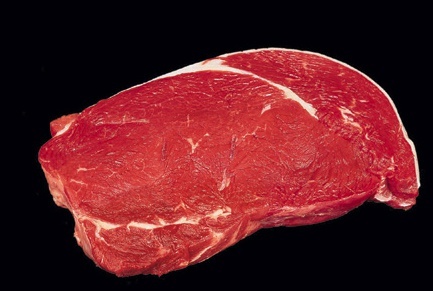 For example, for a medium rare steak from the thick edge – for 5 minutes on both sides. Filet Mignon is cooked faster because of the more loose structure of the tenderloin. Therefore, if you wish to have your steak rare, cook the minions no more than 3 minutes on both sides. Put the finished steaks on the plate and garnish with vegetables of your choice. Now the problem of choice of meat steak is not so acute, because many of the major supermarkets sell packaged beef with the obligatory indication on the label of the carcass and recommendations for its preparation. Some cooks prefer to salt the steak immediately after roasting, not before it. According to them, the salt makes steaks tougher.